The cerulean hue of this handmade vase evokes the clear blue seas of Thailand. 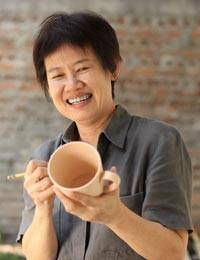 Ceramic artisan Duangkamol crafts the round footed vase by hand, adding textural ridges and a glaze of blue over brown. 15 cm H x 15.5 cm Diam.